When you find yourself surrounded with inspirational people, you often have to step up your game. Which is why I found myself ironing my yellow, starry superhero cape last Saturday evening. 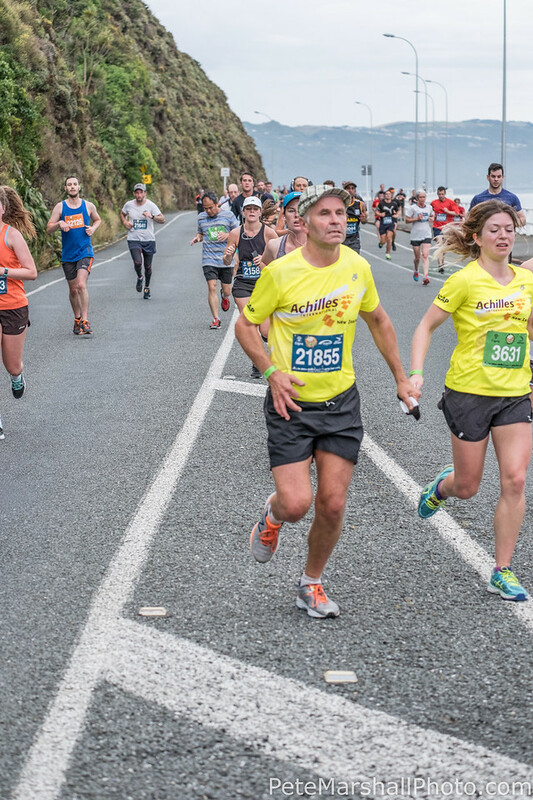 It was the night before China Round the Bays in Wellington, and Achilles International New Zealand is the main charity for the third year running. 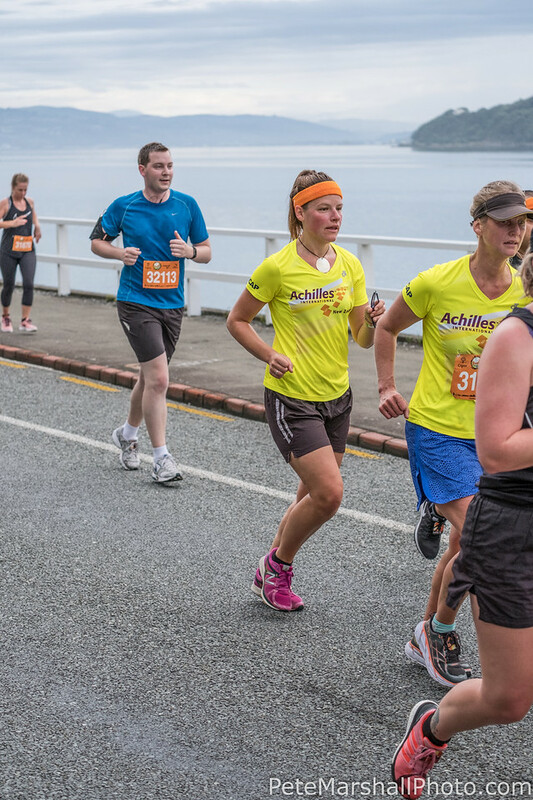 For those who don’t know, Achilles is an international organisation which provides running support and training opportunities for people with any scope of disability. 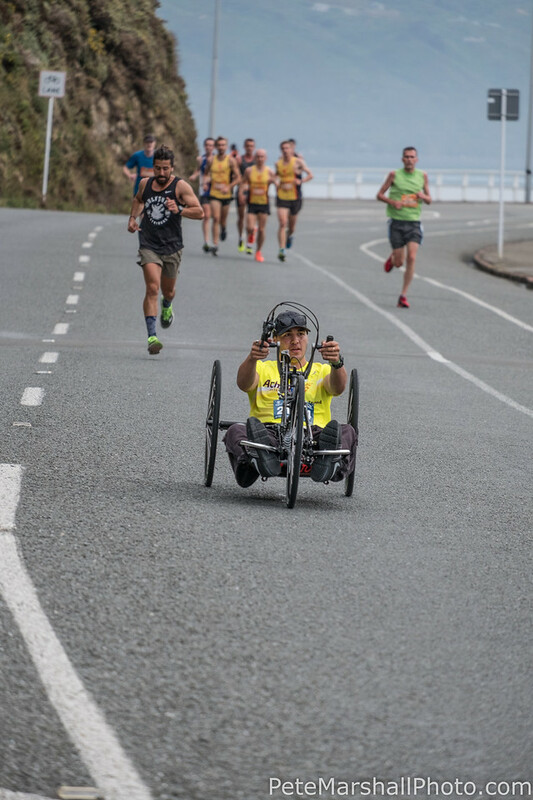 One of the organisation’s main goals is to get those with disabilities involved in mainstream running events. Cigna Wellington Round the Bays is a landmark event for Achilles International NZ and athletes and guides from all around the country gather in the capital for the event. The weekend started with a pasta party hosted at the Southern Cross bar in Wellington. It was a great opportunity for all the Cigna and Achilles team to get together, mix and mingle and talk strategy for the next day. Saying that, I’m pretty sure I saw a couple of athletes at the bar drinking French martinis and others reminiscing about the recent New York marathon very enthusiastically, so I’m not sure how much strategy talk was happening. 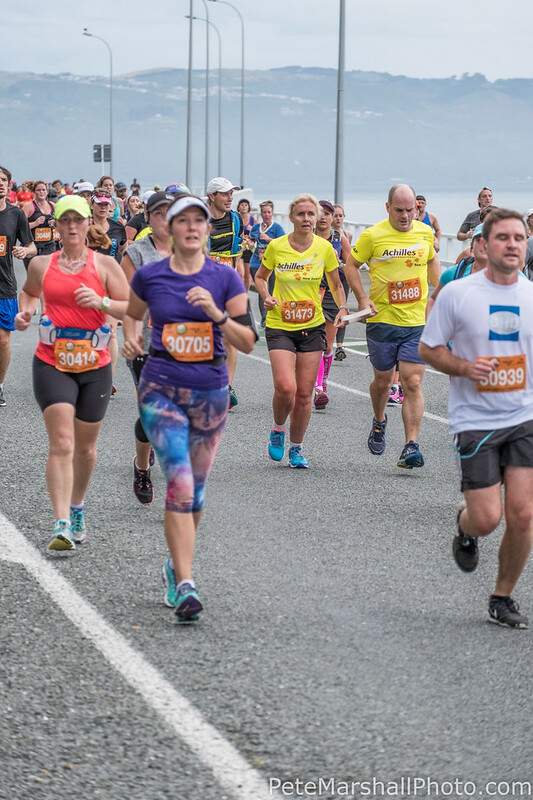 Cigna Round the Bays was celebrating it’s 40th year this year, and as usual there was a 21.1km, 10km or 6.5km that athletes could choose to run, walk, hop, wheel or hand cycle. I was taking part as a second guide for blind runner Ali, along with her number 1 guide Matt. Ali is totally blind so requires a tether to run with a main guide giving instruction on any obstacles or direction. A second guide is helpful at busy events such as this to help clear the way and allow the first guide to concentrate on the terrain. Race day came and I’m lucky (?) to live 4km along the course from the start, so as I walked/jogged my way round in the morning I was greeted by troops of Cigna staff, volunteers and army cadets setting up the first few aid stations. Pretty early start for those guys! They’d also be out until the last entrant came through, likely 12 or 1pm, so a long day too. I arrived to a swarm of yellow (Achilles) and blue (Cigna) t-shirts at the VIP tent, made a beeline to the coffee stand and started to get pumped for the event. The organisation was so smooth and everyone so relaxed. It was also great to meet a few more Achilles members from around the country, and catch up with some familiar faces. It wasn’t long before we were rushing from the toilet queue to the start line, making it just in time for a head to toe “feel good” check before the horn sounded and we were off. There were 0000 people doing the half marathon, so it took a little while to cross the line. It was Ali’s first half marathon, so our main goal was to get to the finish line but we were hoping to get there in around 2 hours 15/2 hours 20. We weaved in and out of the sea of runners, me acting as body guard and Matt pulling Ali left or right … All the while giving the opposite direction verbally. You’d think knowing your lefts and rights would be a prerequisite to guiding, but Matt has seemed to get away with it for quite a number of years now. 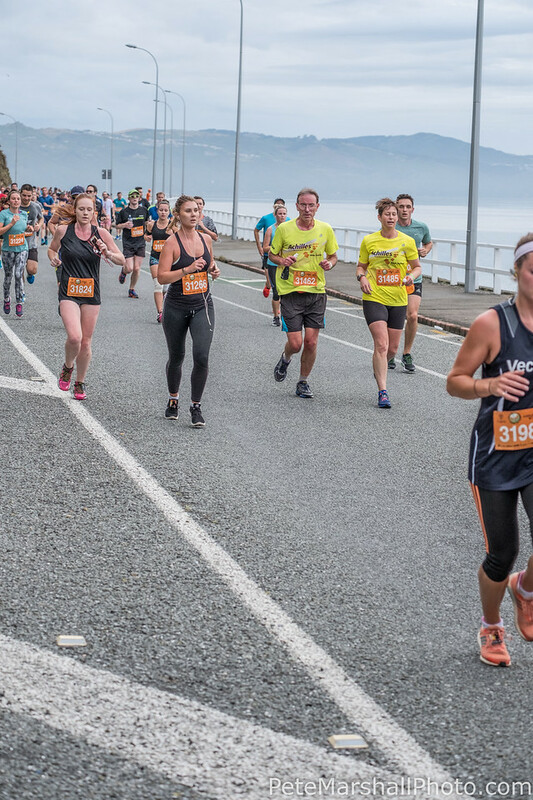 We carried on towards point jerningham, surrounded only by the echoing sound of hundreds of feet pounding the pavement, everyone in the zone getting their head in to the race. As usual, Keo Bay residents were on form, ready with the balloons, flags and hoses to keep everyone cool and motivated. 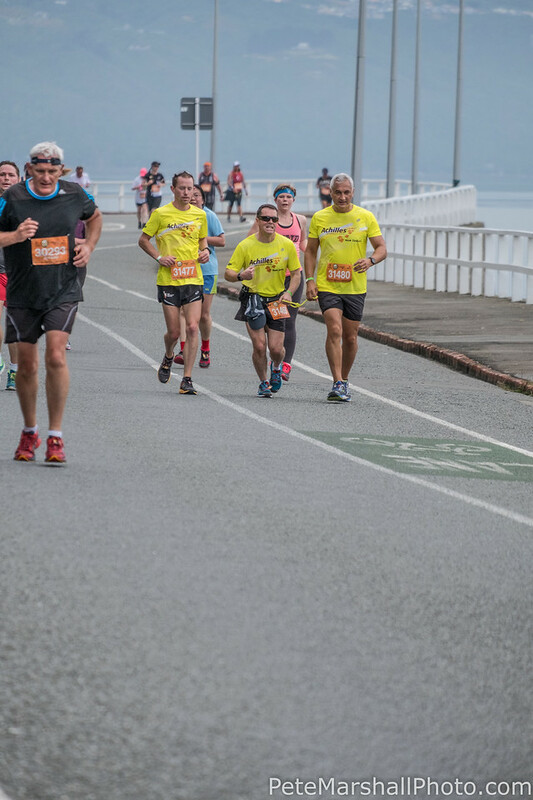 As we kept on round the Bays,we continued to keep a steady pace and were all feeling good. 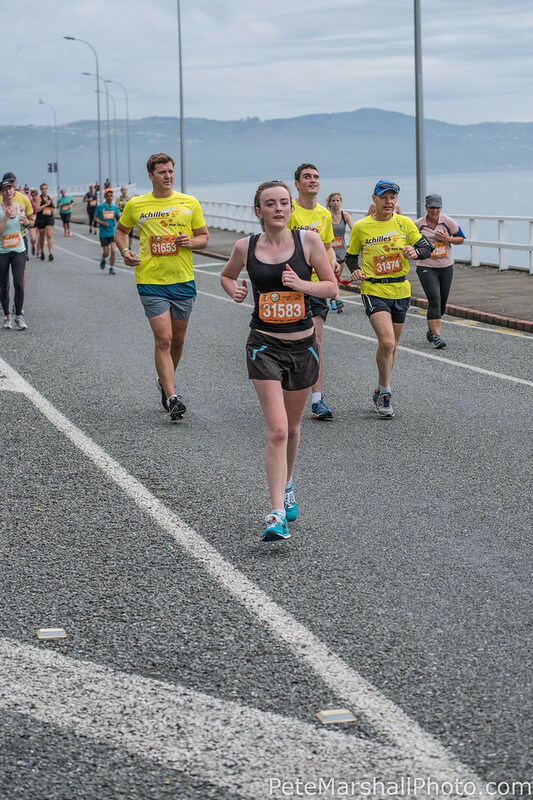 We got heaps of support and chat from other runners, and it was really the perfect conditions for a run around the Bays. We reached the 5, 6, 7km mark with no hassle, arriving at the Miramar junction without really noticing. Ali was running like a machine and the pace was going well. As we turned to go up scorching bay, we began to muse about how the front runners were doing, and just a km or so later the first one flew past. The next few followed and the steady stream of those on the way back got busier. Soo many people shouted encouragement to us, no matter what level of pain they were in. This highlights the community of running that Achilles has stemmed from, everyone just loves to see others out there doing it. We pushed along the mildly undulating trip round the Bays towards Scorching Bay, the kilometers slowly but surely ticking away. Matt managed to knock one of the safety pins on his number off around half way, so I took over the tether for the rest of the run. Matt was a much better body guard than me anyway, the cape hadn’t helped as much as I’d hoped. We began to catch up with another couple of Achilles athletes from out of town, and pass some others who were on the return stretch. It was so great to have so many athletes taking part, and witness everyone pushing hard and achieving amazing things. A couple of overtakes later and we were at the turnaround point, heading back toward Kilbirnie and with about 7km to go. Ali still running amazingly strong. We then had the joy of saying hello to everyone who was behind us, giving a great perspective of how we were doing in the race. The rain started spitting around 16km, and my cape got a bit wet and heavy on my neck. The path was mostly clear for us to run through though and we continued with our steady pace, climbing places as we went. Matt sneakily quickened our pace, but Ali kept up without any trouble. All of a sudden (?) There was only 1km to go. We sped up a little bit more and tried to give Ali a picture of how we were ticking off the last few hundred metres. We crossed the finish line in just over 2.05 ish, smashing our original target. 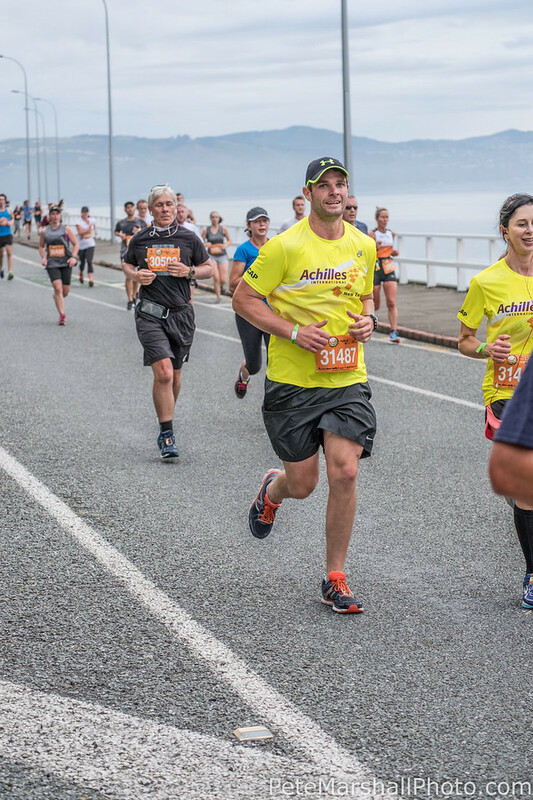 Well done to all runners, walkers and wheelers for competing in this year’s Cigna Round The Bays, I know everyone at Achilles is already looking forward to next year!! A year or two ago I was on an early morning flight from Wellington to Auckland. It was a cloudy, dreary day in Wellington, but as the plane popped out above the clouds in to the sunshine, I looked south and could see the tops of the Kaikoura mountains poking through. I immedietly imagined what it would be like to be sitting on top of the highest peak instead of in my aeroplane seat, and so began my longing to get to the top of Tapuae-o-Uenuku, or “Tappy” for short. 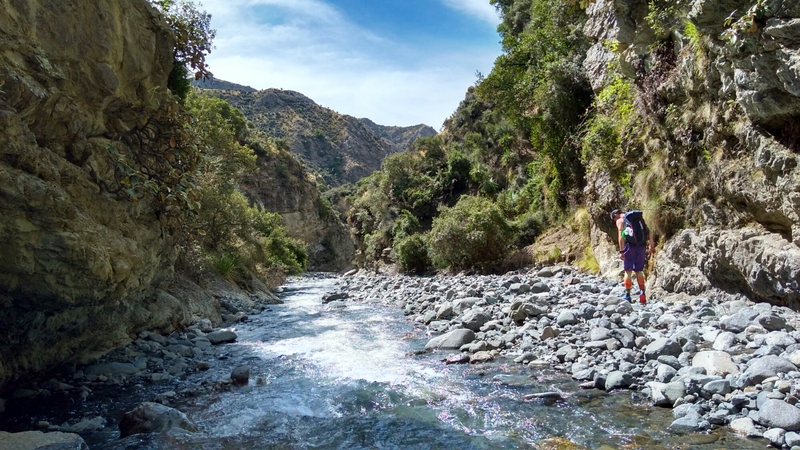 A bit of research taught me it was a bit of a mission to get to, a 22km hike up a river before reaching the base of the mountain.. most write ups recommending 3 or 4 days to climb. The track is also not marked, and some navigation and climbing skills are required, although many said it was doable for the moderately experienced. 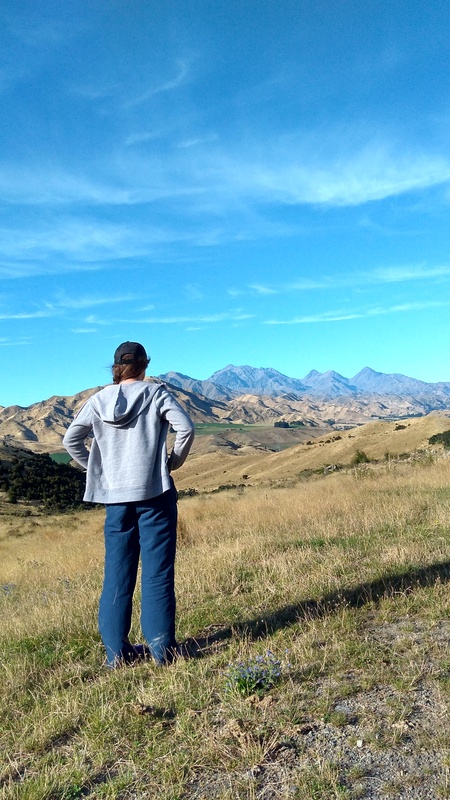 I initially pencilled in a trip to Tappy for the start of my South Island trip, coinciding when a running friend (Mark) who had been up the mountain 7 times already might be in the area. However, since the 7.8 magnitude earthquake which shook Kaikoura badly in November, road closures made it look more difficult and the mountain fell off my radar for the time being. It was fortunate then, when my brother and I found ourselves heading north from Wanaka with a few days to spare before we had to be in Nelson. 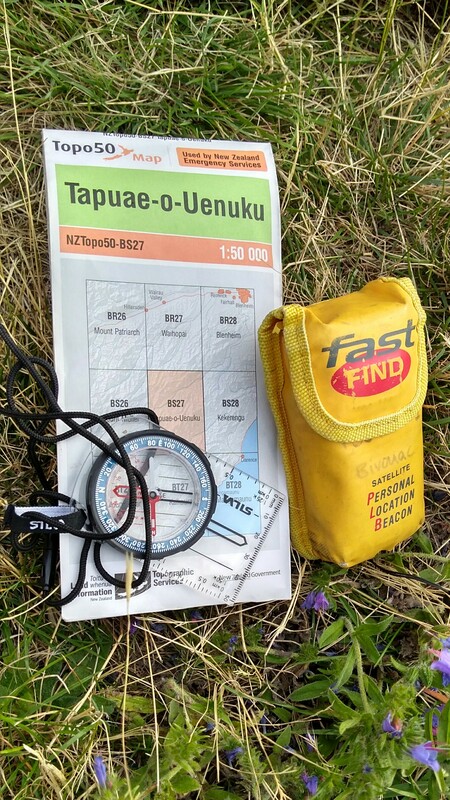 A relatively short time googling, calling the land owner and getting advice from Mark, we found ourselves in Bivouac buying a Topo map, new compass and hiring a PLB. During this googling, I also learnt that Tappy was Sir Edmund Hillary’s training ground before he climbed Mt Cook (and then on to Mt Everest), so it became even more exciting. After camping at Hanmer Springs, we drove for 3 hours in the rain along an unsealed road. The weather forecast had promised clearing in the north east, and we really hoped the river was going to be passable. 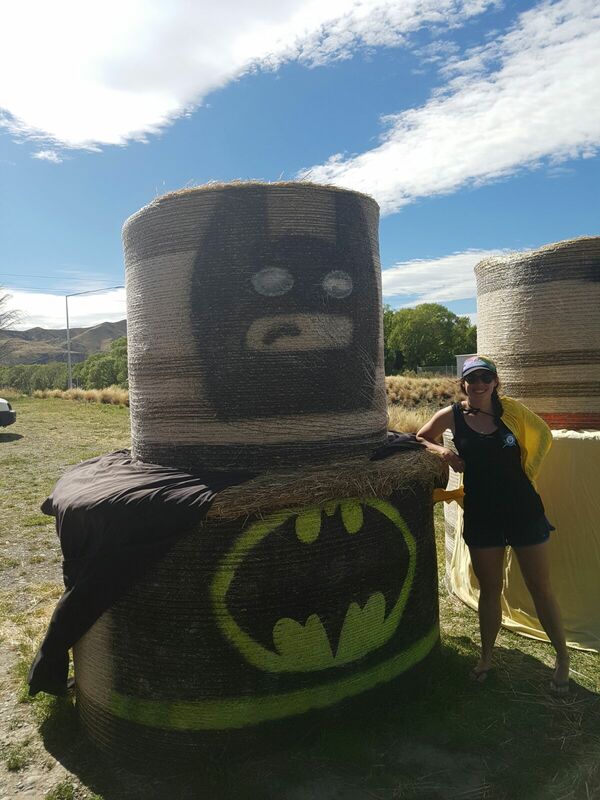 As we arrived at the track head, we met Allan the farmer. A very friendly man who seemed to know the mountains extremely well and whom you must get permission from before climbing, as the start is on his land. He warned us that the river was high, but not impassible and it wasn’t meant to rain any more. He also warned of the wind forecast and that it might be cloudy tomorrow.. but off we set. After an hour or so of walking along farm tracks, we found the marker suggesting we climb down the bank on to the river bed. We were instantly wet, and continued to be so for the next 5 hours. Neither of us had a lot of river experience and the water was flowing fast and dirty, so our first few crossings were slow as we tried to learn to pick the best paths. It was so thrilling (mountain geek alert) to know we were following the same footsteps as Sir Ed, especially as it is likely the valley still looked very similar to when he was passing through. It was a hard slog up the river as we had to constantly be thinking about where to cross and where to put our feet on the rocks. We also had to keep an eye on the map and our progress, but Diain’s watch was able to give us GPS coordinates of our location which was super helpful.. if not a little bit disheartening when we weren’t quite as far along as I’d hoped. We also pased a few new bits of rockfall which apparently had happened in the November earthquake, making me more than a little anxious about what-if-theres-another-one and what-if-we-get-stuck. But we’d come this far now.. After about 3 hours, we were directed off the river bed to climb up and over an impassable waterfall. 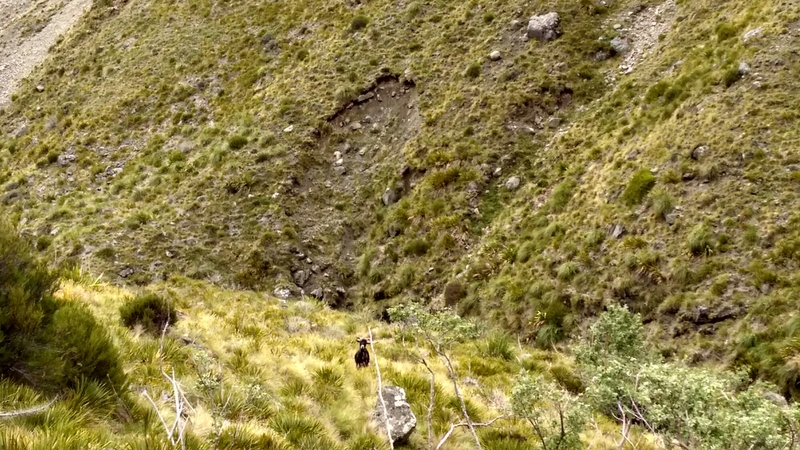 It was a sketchy climb up some goat tracks and Diain lost his footing on the way back down, sliding a way before a combination of a rock and his shin slowed him down to a stop. It was quite a chunk out of his shin, and I had to flick away a bit of fatty/dermal tissue nonchalantly before plastering it up enough to get to the hut. Luckily we only had one more crossing of the river before we spent some time getting lost bush bashing then following the bank towards the Hodder Huts. The first sight of the huts was glorious, and as we got close we disrupted quite a big deer, who proceeded to bound off in to the distance. I was totally exhausted when we arrived, realising we hadn’t stopped or really eaten for 6 hours. 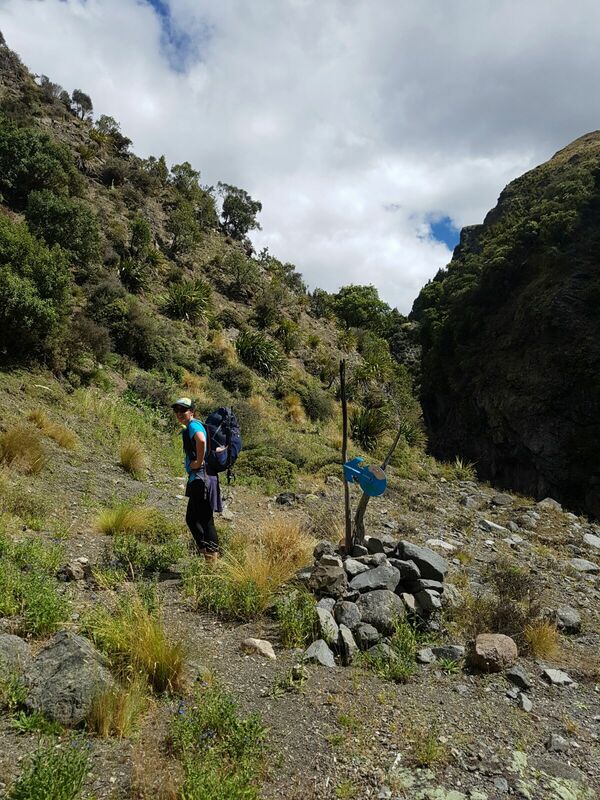 It felt like we had already been on a massive adventure, and we were only at the 1600m base of a nearly 2900m mountain. The chance of us getting to the summit and back out again the next day was becoming more unlikely, and as people were expecting to hear from us before a certain time and we weren’t sure of the long range weather forecast, we had to be sensible. It was great to read all the stories of people’s adventures in the hut book, about 50% of them reaching the summit successfully, most spending at least 2 nights at the huts. We survived a windy and slightly earthquake-y night in the hut (only one small one, but fun for Diain’s first!) And woke up to cloud covered mountains, and still a bit of a breeze. We decided to wait til it was light then head up for 2 hours or until we reached the cloud, whichever came first. We followed a well trodden path along some scree then up staircase stream, before heading in to the lower basin between Tappy and Mt Alarm. We climbed a little, before we couldn’t see much more than cloud so decided to turn around. At about 2100m we were about 1.4km as the crow flies and almost 800 vertical metres to the summit. Disappointing but no point risking it with wind, cloud, an unknown forecast, a damaged shin and a broken shoe (my sole took a beating on all the river crossings). 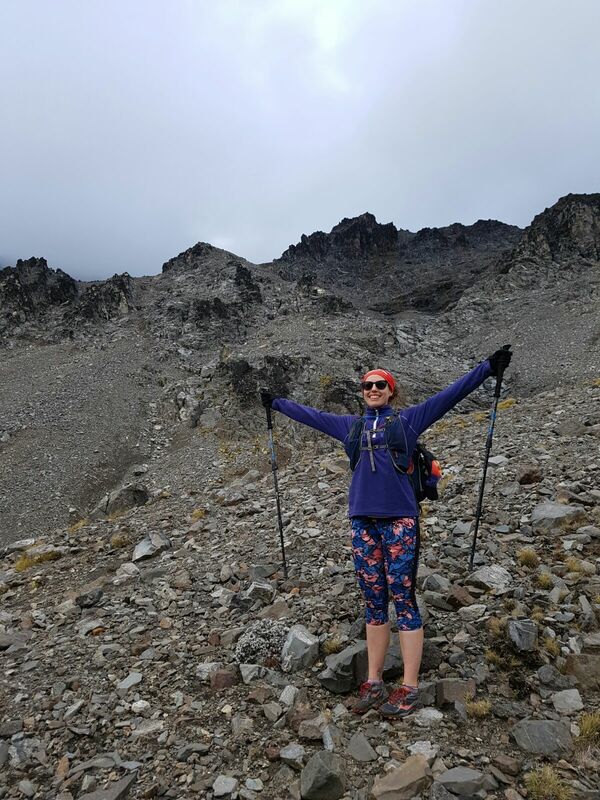 I felt like we’d still had an awesome adventure and I’d got to use my hiking poles on the climb up which was great practice for Nepal. We headed back down towards the huts for a snack and a cup of tea. On doing so we realised we only had one tea bag left, another sure sign we had to head off the mountain! 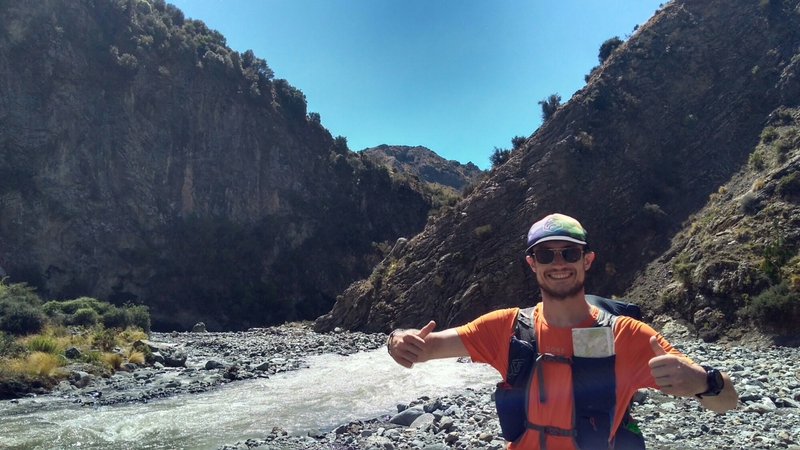 We were hoping it would take us less time going downstream, but even though the water was clearer and our confidence with river crossings was growing, it still took a solid 6 hours to get back to the car. As we reached the end we both admitted our anxieties that we had along the way; mine of an earthquake and avalanche, and Diain’s of being unable to cross the river and getting stranded in the mountain. Quite cool to share an experience where we were both pushed towards the limits of our comfort zone. We didn’t see another human the whole time, and it was pretty special to be on an unmarked route, sharing it only with hares, mountain goats and a couple of deer. Not to mention the many adventurers who had trodden the way before us. I learnt a lot about crossing rivers, and gained map and compass skills.. not to mention the importance of a properly stocked first aid kit and the reassurance of a PLB. 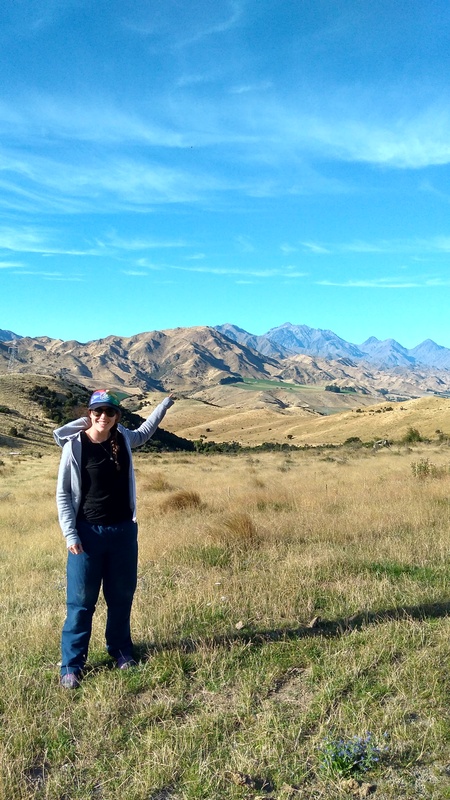 So Tapuae-o-Uenuku has to stay on my bucket list a little bit longer, but I feel I know the mountain a little better. And after seeing it in all it’s glory on our drive out, the desire to get to the top is even stronger. Just yet another reason to return to New Zealand I guess. 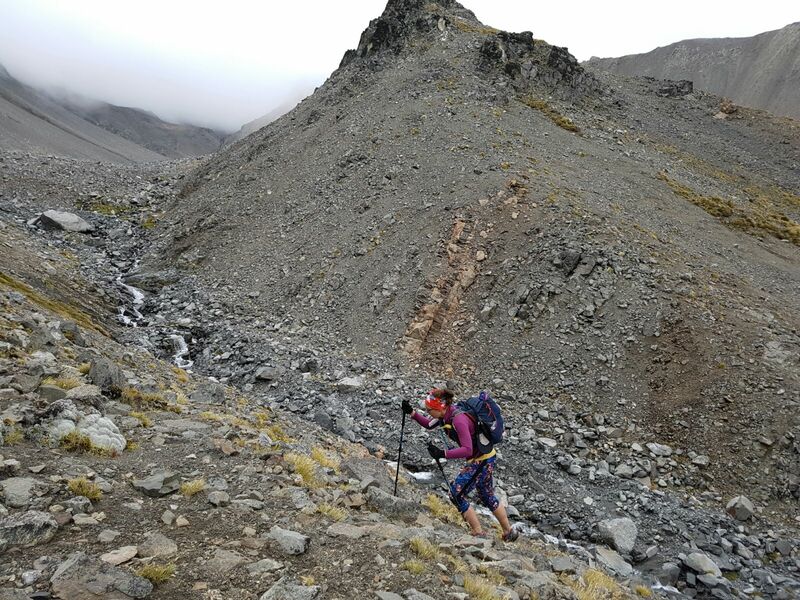 Fastpacking: Going slightly further, faster and lighter than tramping. 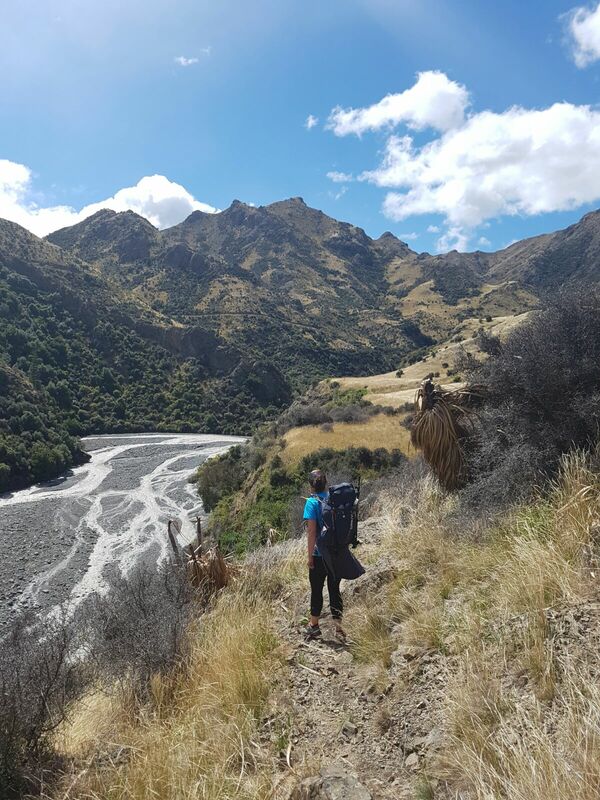 New Zealand has such a vast and varied landscape that they have 9 “Great Walks” highlighting the best they have to offer. These are amazingly well maintained by the Department of Conservation and are hugely popular with kiwis and tourists alike. Over my 4.5 years in the country I’d ticked off 4 of the 9 and was keen to do some more before I headed off. Three of the ones I was missing are all in the Fiordland National Park, tucked in the south west corner of NZ – kingdom of the sandflies. Each one was advertised as a 3 or 4 day walk, so thus came the challenge of trying to fit them in to a shorter (but still enjoyable) time… A week maybe? 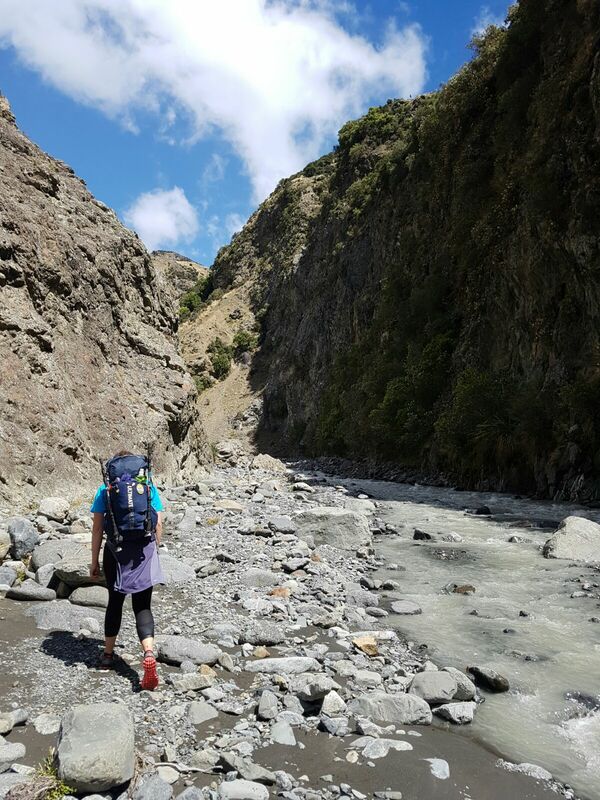 The Milford Track was the most logistically challenging. DOC have the lottery on when people arrive at the track by boat, and the earliest they could have us get there would be 2 or 3pm… Not really long enough to run 53.5km and catch our boat at 6pm. So after a bit of research we found Wings and Water, a float plane who would happily take us to the track as early as we liked. Awesome. As our pilot Ivan said, looking at the floats we were a bit heavy each with our 10kg bags full of 3 days of supplies. But after a bit of effort and sweet talking from Ivan (to the plane) we were off and away. Such an exciting way to start a week of running. The Milford Track is spectacular. Starting by winding along side a river through the bush, before opening up in to a valley with massive glacial mountains towering above us. We all had to keep remembering to stop and look up, and every time we did we were awe struck. There’s a solid climb up to the McKinnon pass, named after the first explorer to track the tourist route in to Milford Sound in 1888. After the climb we were rewarded with amazing views over the whole valley, who knew white clouds and grey mountains could be so beautiful. As we came down the other side we started to catch up with more walkers who were all stunned we were running the track in one day. The clouds parted and the blue skies made the mountains even more spectacular. It was quite tough running down hill here so a bit slow going, and we were all kind of knackered by the time we reached the third hut. We had 18km to do in 3 hours to catch our boat.. should be doable. I ran with my brother for the most part, but I don’t think we actually said more than 5 words to each other the whole way. My eyes in the picture below reveal the pain I was in I think. 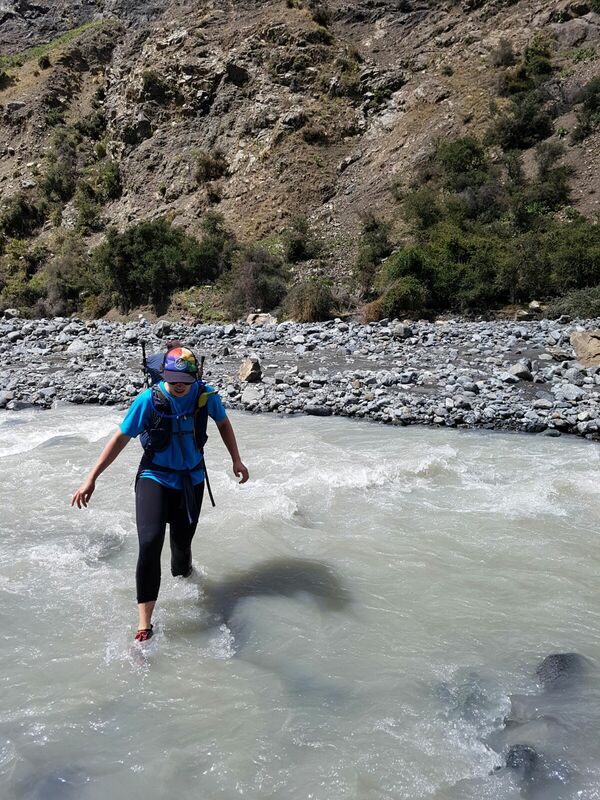 I had totally ran out of energy, the 10kg packs making the 50km a whole new challenge. We made it to Sandfly point just in time and enjoyed the 5 min Rossco boat ride in to Milford Sound. We’d booked in to the backpackers at Milford Lodge so all enjoyed indulging in local beers, hair washing and a hot dinner. After all sleeping for about 10 hours we had a very slow and chilled morning drinking coffee and playing cards. We were relying on public transport to get us to the start of the Routeburn Track and our traknet bus wasn’t until 2.30pm, a welcome rest after yesterday. The rain cleared by the time we reached The Divide and we had a sunny 3.5km wander uphill to Lake Howden hut where we were going to stay the night. We arrived in good time so decided to drop our packs and have a run up and around Key Summit. The views up there are amazing and it felt so fun to be playing around without our packs on. We were again relying on public transport, so we had to finish the rest of the Routeburn and catch our bus at 2pm from the shelter car park. We started early, and although it was dark and rainy the trail was still really fun to run. We were all grateful for the lack of wind which would have made it a lot more unpleasant. We reached the first saddle without too much effort but were surrounded by thick cloud, only giving us teases of the mountain vista we could be having. 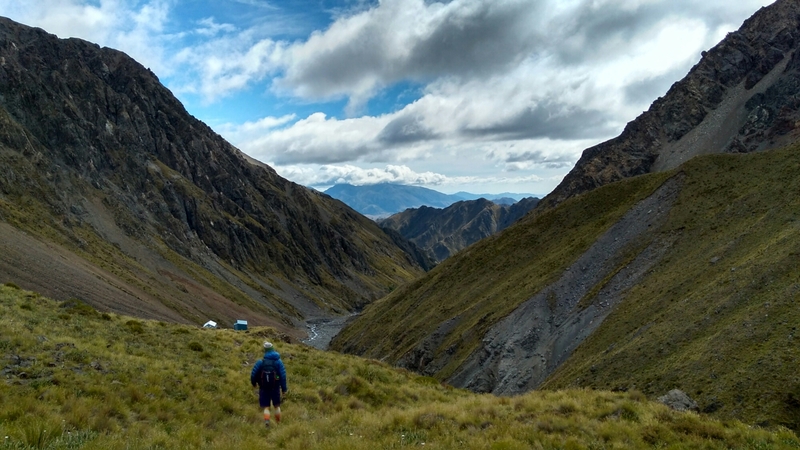 We pushed on along the ridgeline to Harris Saddle, enjoying the terrain and atmospheric surroundings. 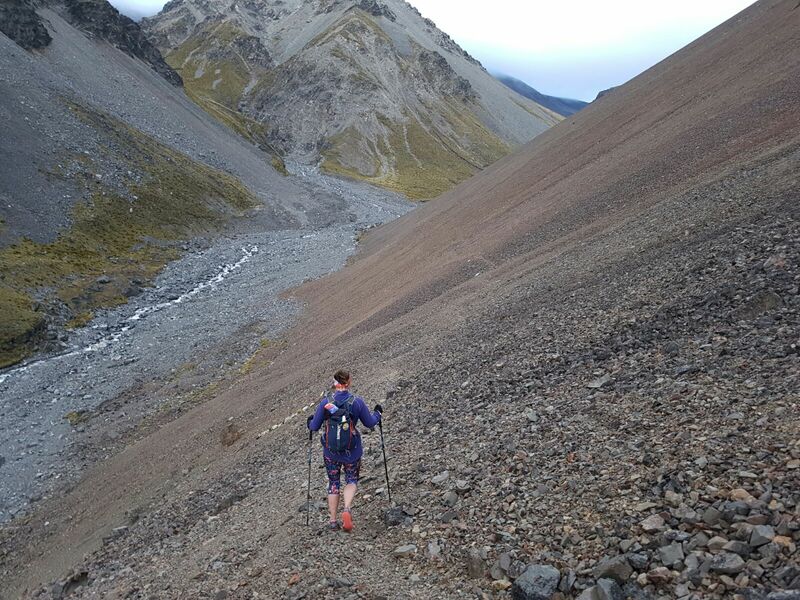 It was rewarding to reach the shelter below conical hill, and we met a couple of local runners here who were stoked we were enjoying the track. After refuelling on the standard salami sticks and pretzels, we pushed on down the hill to make sure we caught our bus. The sun came out as we turned in to Routeburn Valley and the views were pretty incredible. Cue a few staged shots for my video 😉 we wound our way down the hill, meeting a few day walkers and running in to some friendly faces from Wellington. After bandaging up a fellow runner who’d fallen on some rocks and cut his hand, we reached the bottom and as usual I totally lost motivation to run along the flat. We had 90 minutes or so to do the 7 or 8km so I slowed right down and enjoyed the forest. 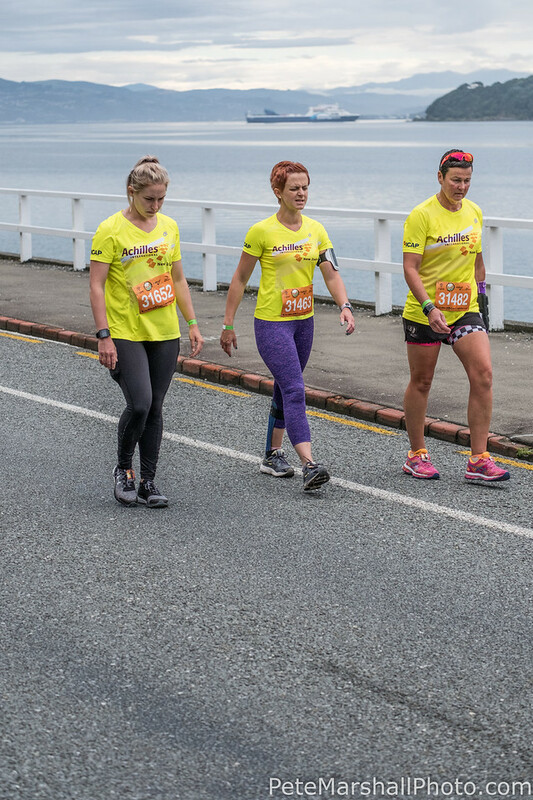 The Routeburn is such an awesome day run and I reckon the race (Routeburn Classic) would be such a cool event. We had a decent bus trip back to Te Anau from the Routeburn, not arriving at the camp ground til after 7pm. So after a celebratory BBQ and beers, we all crashed out and enjoyed a lie in the following day. We’d planned a rest day to restock and recover, so spent it reading, playing cards and eating pies from Miles Better Pies in Te Anau. Time for our third and final Great Walk to complete the Fiordland Adventure. 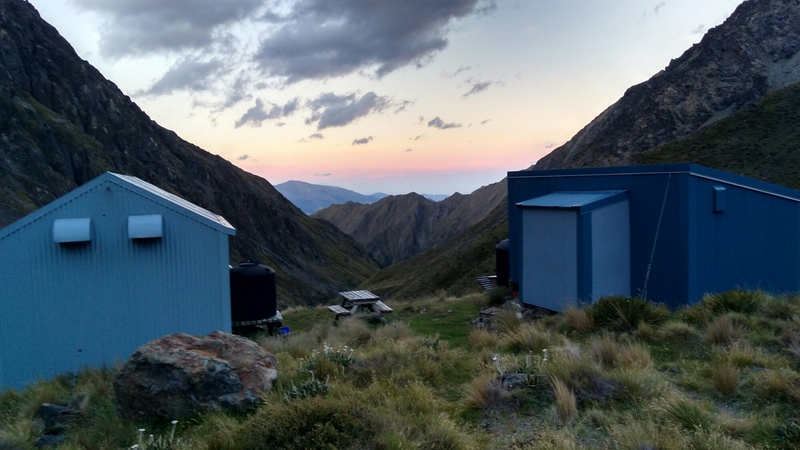 We had booked in to Iris Burn hut on the Kepler Track, pretty much exactly half way along. This meant we could choose which direction to run depending on the weather. As we packed up the tent in the rain, we all agreed we should run through the bush on the first day, and save the tops for the better weather forecast on our final day. We had (another) slow start and set off along the track around midday. We decided 60km wasn’t enough and walked to the control gates from the camp ground, adding an extra 7km or so round trip. It rained pretty consistently til we reached the hut, but again no wind meant it wasn’t too unpleasant. There were some fun switch backs up and down, but in general just some standard, beautiful NZ bush. Perfect place to be on a rainy day. We didn’t have a bus to catch, but some of the others had real life to get back to so again we set off for an early start from the hut. From Iris Burn, there’s a steady climb for about 4km until you come above the bushline. Reaching the ridge in the early morning sun was pretty special, especially having the track to ourselves for the first few hours. We took it slow, soaking up the sunshine and the views and taking it all in before it would too quickly be over. 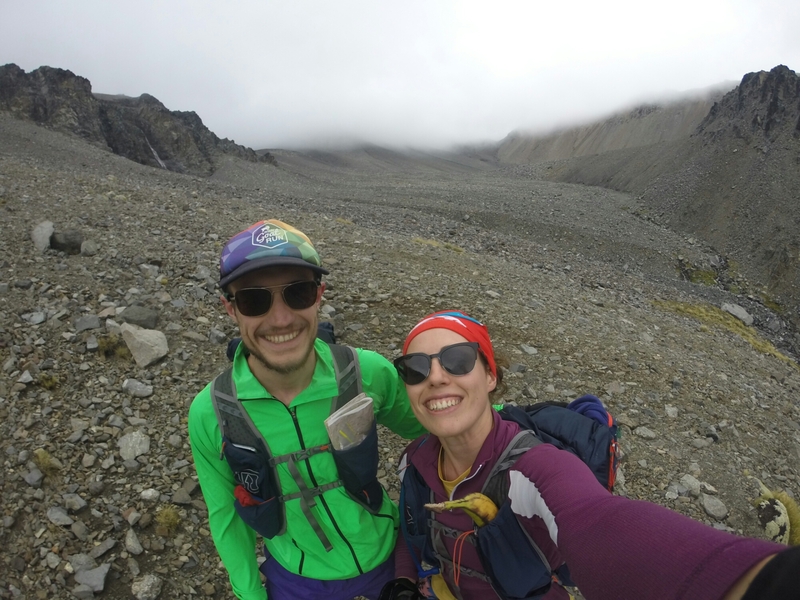 The 15km or so along the tops of the Kepler Track has got to be one of my favourite ever runs; amazing mountains and lakes, glorious single track trails and smiles from everyone along the way. After Luxmore Hut we said goodbye to the mountains and headed in to the bush again. My running style became more and more penguin like as the 150kms with a 10kg pack caught up with me, but the smile wasn’t fading. We all gathered at Brod Bay campsite before the last 5km back to the control gates to finish off the week. Holy moly, what an experience. New Zealand is such an incredible country and now I’ve definitely got a little corner of my heart reserved for Fiordland. Thanks to the Department of Conservation for looking after the trails (and the trampers and runners) and to the boys for keeping me company this week! The road goes forever on and on.. but where to next? ?